World Premiere of First Track – ‘Bless These Blues’ – via Elmore Magazine – Today! Delta Deep to perform at select dates of G3 tour featuring Joe Satriani, John Petrucci and Phil Collen. 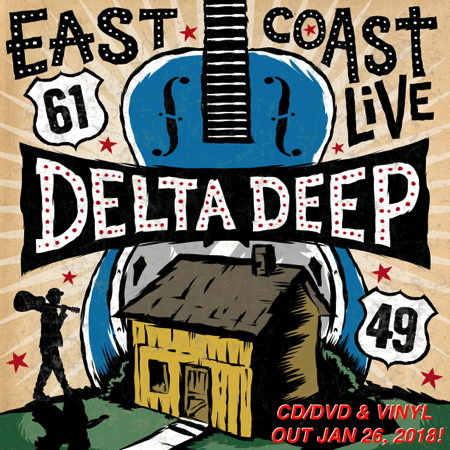 (Los Angeles, CA) November 30, 2017 – Blues-Rock-n-Soul supergroup DELTA DEEP is thrilled to announce the release of their sophomore album East Coast Live through Frontier Records. The group, which made their chart topping debut in 2015 features Phil Collen, lead guitarist of Def Leppard, Debbi Blackwell-Cook (back-up vocalist for such artists as Michael Buble & Gregory Hines), Robert DeLeo (bassist for Stone Temple Pilots) and Forrest Robinson (drummer for Joe Sample & The Crusaders, India.Arie & TLC). Listen to the first track, “Bless These Blues,” exclusively premiered today at Elmore Magazine.